When I was younger and my family would go out for Italian dinners I would often get the penne or rigatoni ala vodka (aka a tomato vodka cream sauce). For some reason I forgot all about my love for this sauce until I came across a recipe for it one day as I was reading blogs. 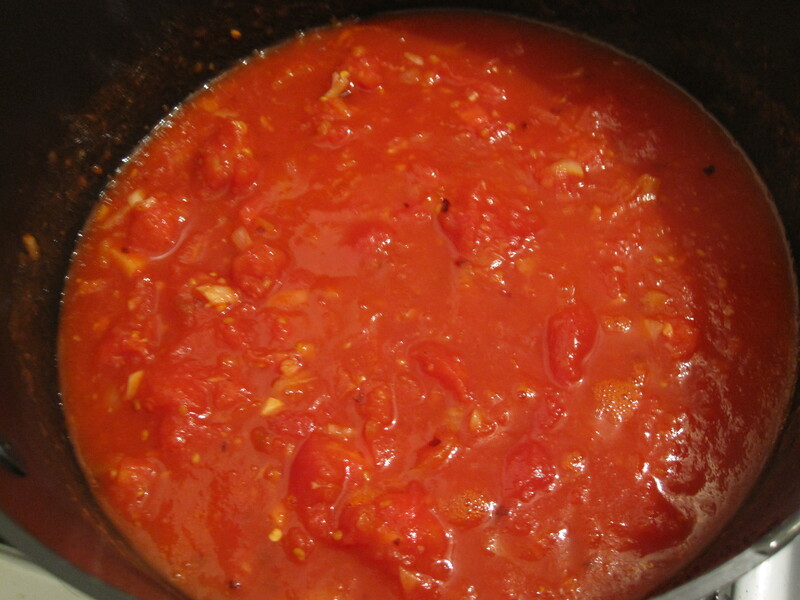 Luckily, this sauce was super easy to make and just as decadent as I remember. 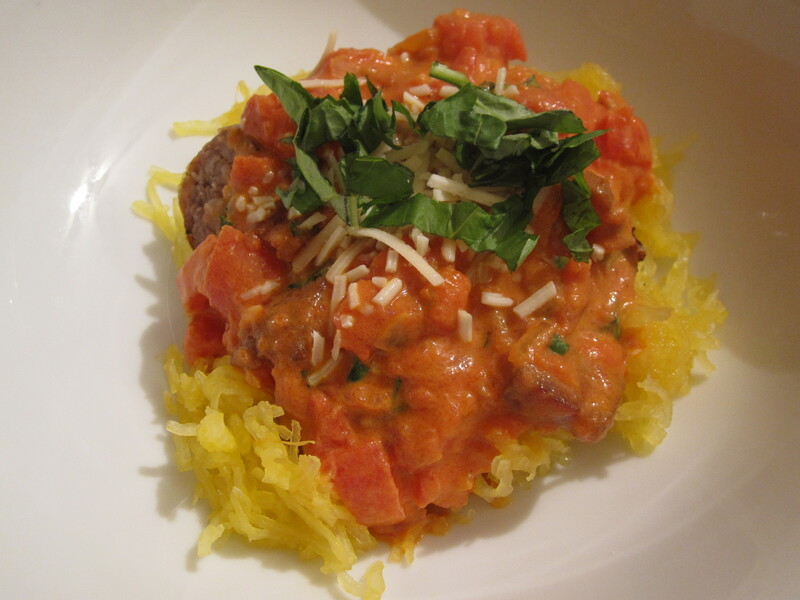 We served it with sausage for some added protein and spaghetti squash instead of pasta. It was divine! I encourage you to try this, you won’t be disappointed. First, some of the ingredients. We are lucky enough to have some really great food shopping opportunities here in Pittsburgh. We got our pancetta and sausage from Parma, where they make these products in house, and the tomato bases for the sauce and cheese from Penn Mac. I’ve said it before and I’ll probably say it again, but good, quality ingredients always make such a difference! 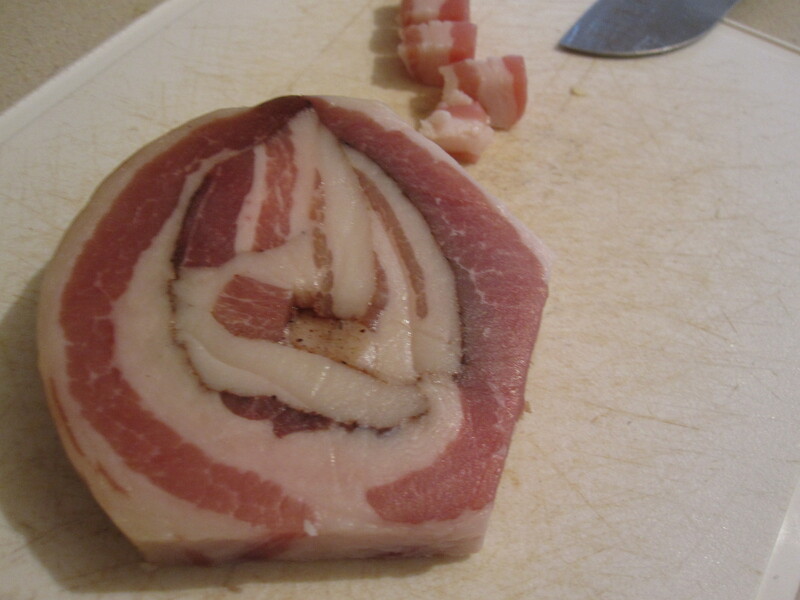 Similar to bacon, pancetta is a dry cured pork product. Dice it up just as you would bacon. 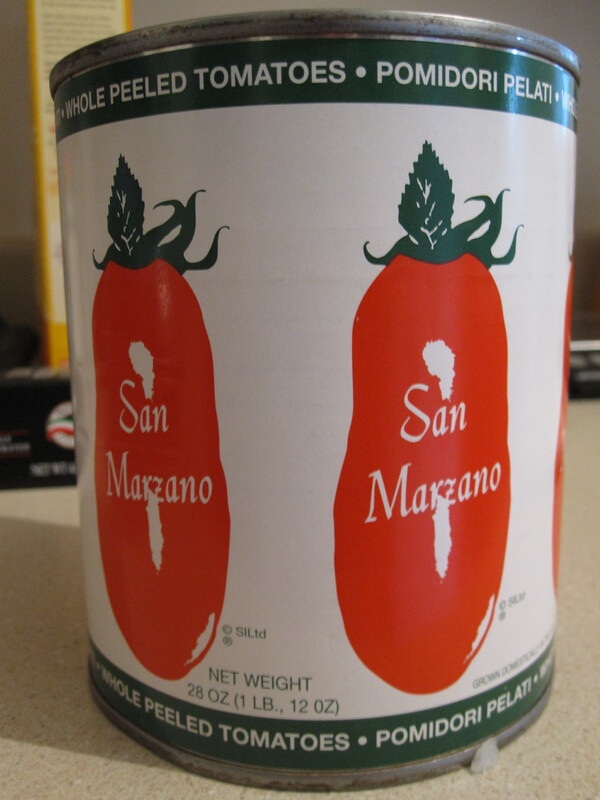 San Marzano are supposed to be the best. Now on to the recipe. 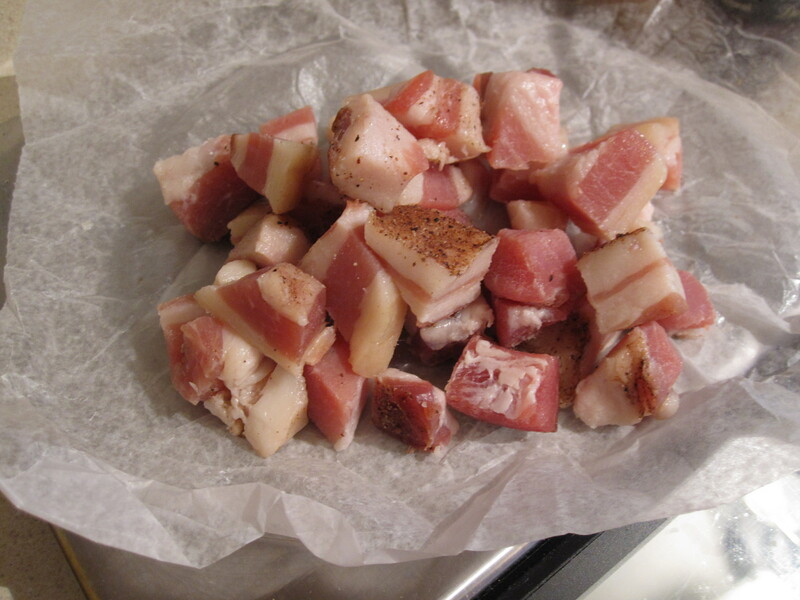 Begin by browning the pancetta, and set the cooked pieces aside once they are nice and crispy and most of the fat is rendered. Keep the fat though as you will use it in just a minute. 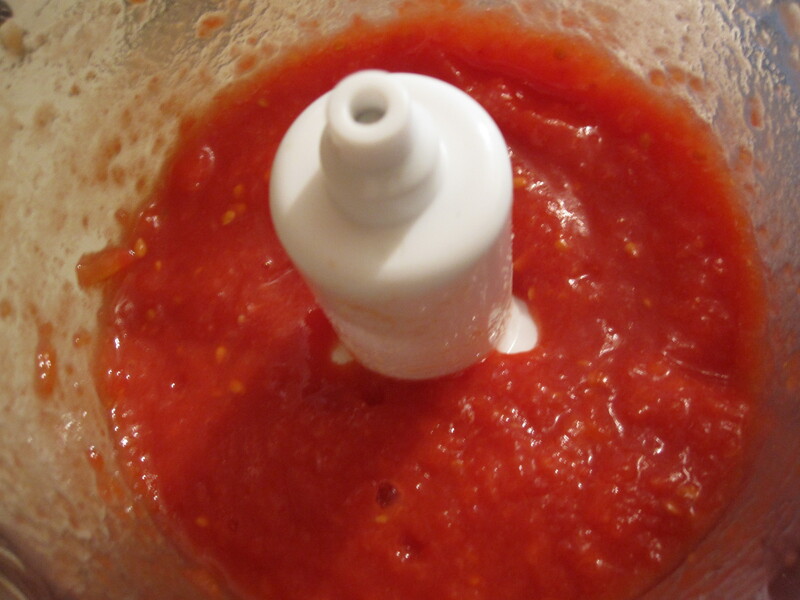 Next, puree about half of the tomatoes in the 28-oz. 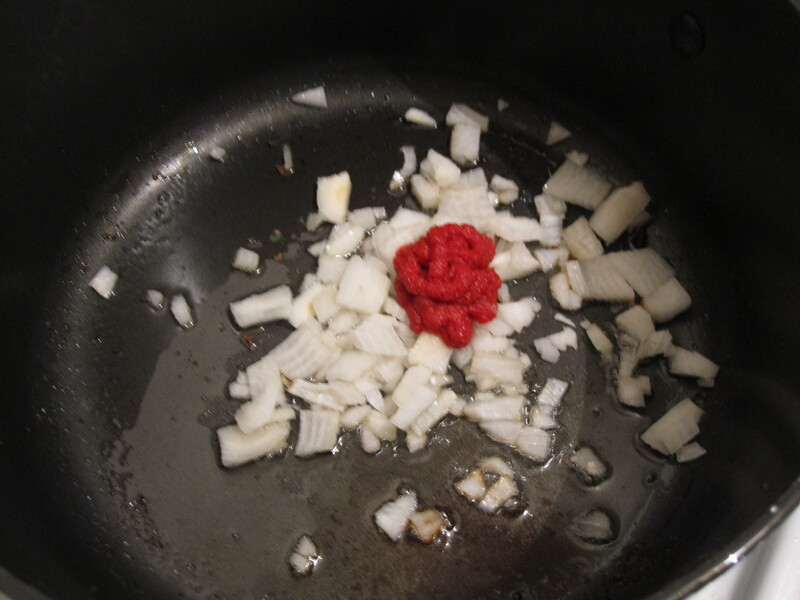 can and chop the remaining tomatoes. 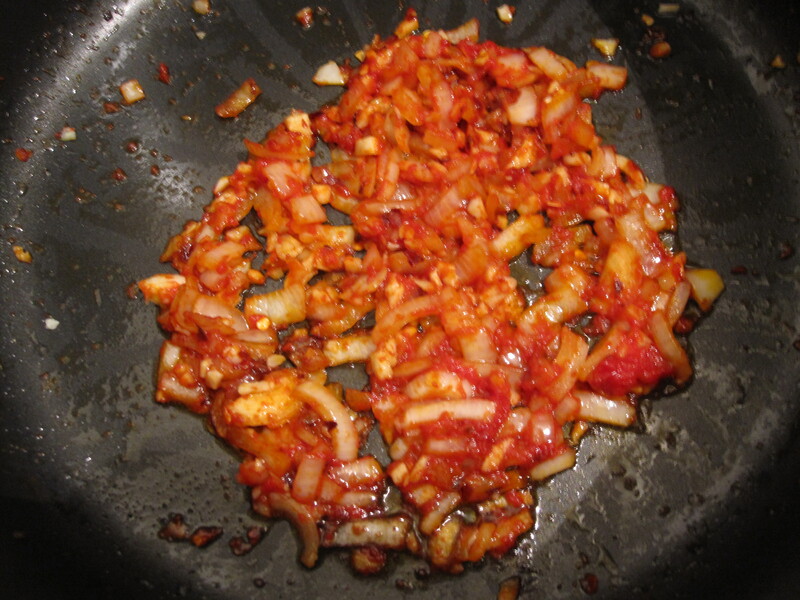 Cook some onion and tomato paste in the pancetta fat. an after a few minutes add garlic and crushed red pepper. 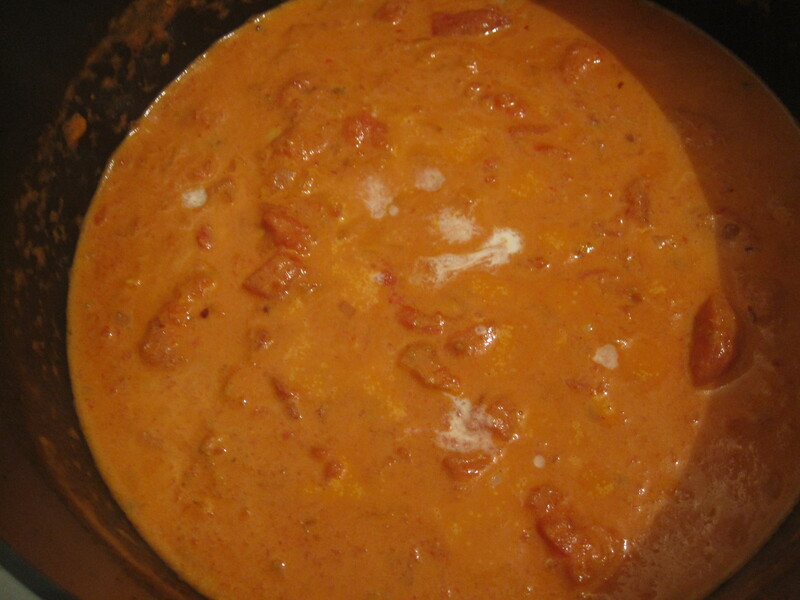 Then add the pureed and chopped tomatoes. Next add the vodka and let it boil off before adding cream- this takes about 20 minutes. Trust me you won’t taste any alcohol! 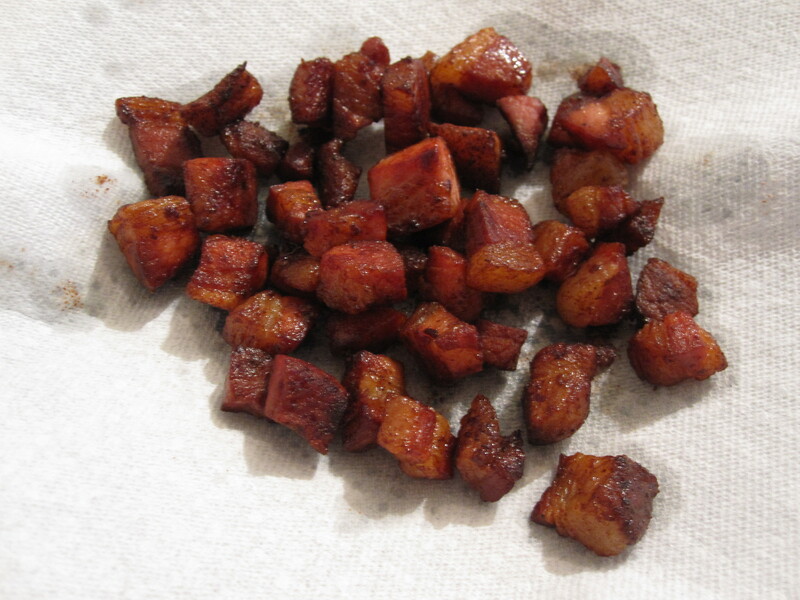 Add the cooked pancetta and some fresh basil and you are good to go! 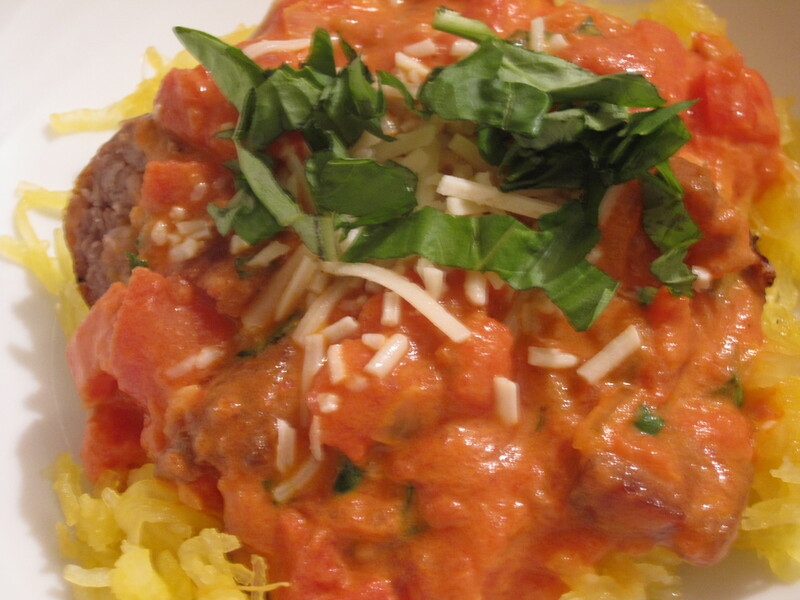 Serve over your choice of pasta and protein (or just by itself!). I was thinking this would also be great with shrimp. Oh and don’t forget to top it with cheese! This sauce delivered on all fronts. 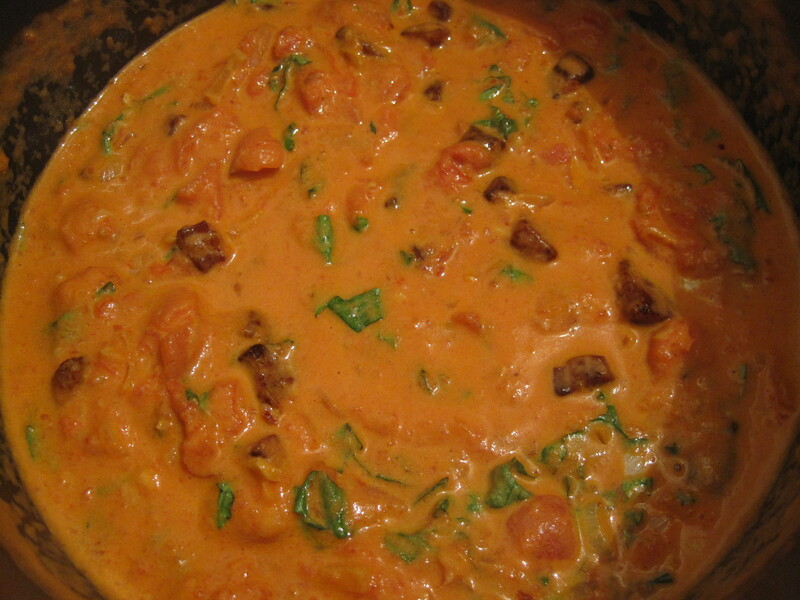 It has the amazing flavor of fresh tomato sauce and the cream adds so much depth. I enjoyed the chopped tomatoes in it and the pancetta and basil just kick it all up a notch. So good and it takes less than half an hour to make. Can’t beat that! 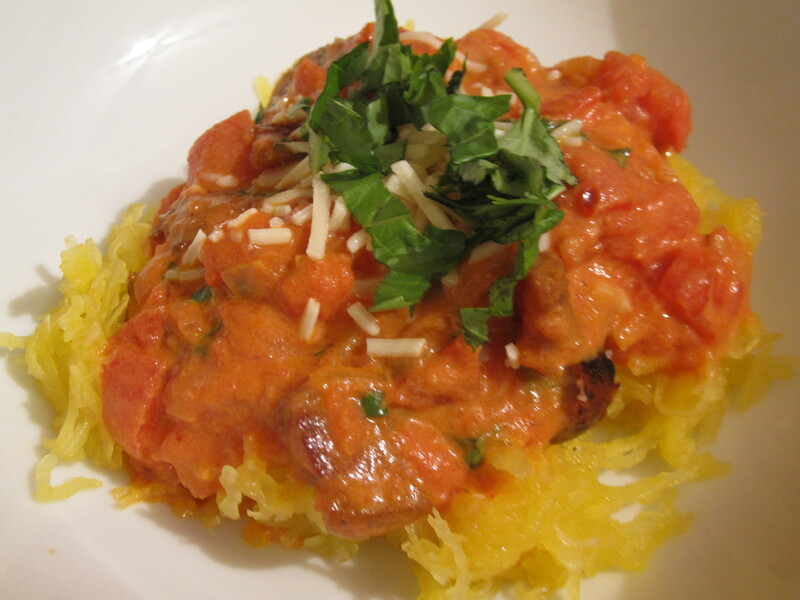 This entry was posted in Sauces and tagged ala vodka sauce, basil, dinner idea, easy, Italian, low carb recipe, pancetta, quick, recipe, san marzano, spaghetti squash, tomato cream sauce, tomato vodka sauce, vodka sauce. Bookmark the permalink.